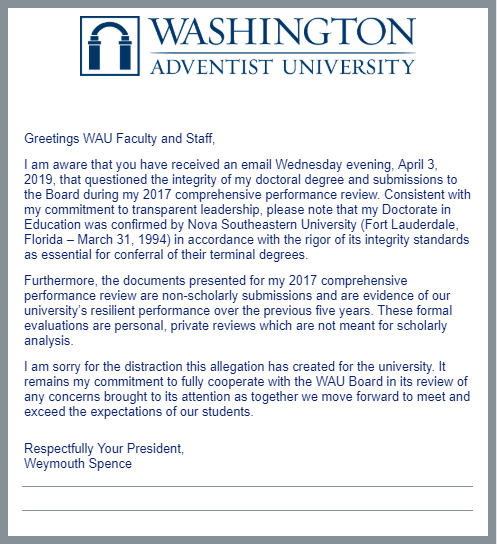 Among the many weighty matters on the agenda for the Washington Adventist University Board of Trustees at its most recent March meeting, the one concerning President Weymouth Spence did not get mentioned in the public report that was sent out following the momentous session. After noting the enrollment gain for the past year and the increase in the school’s assets, the press released announced the plan to put 15 degree programs on hold, and to release two faculty and one staff members, plus reassignment of seven additional budget positions. Faculty members are guessing that Bethany Buckingham is a pseudonym, since none of them know this person. President Spence responded to the faculty immediately on Thursday morning. “I am aware that you have received an email Wednesday evening, April 3, 2019, that questioned the integrity of my doctoral degree and submissions to the Board during my 2017 comprehensive performance review,” he wrote. “Consistent with my commitment to transparent leadership, please note that my Doctorate in Education was confirmed by Nova Southeastern University (Fort Lauderdale, Florida – March 31, 1994) in accordance with the rigor of its integrity standards as essential for conferral of their terminal degrees. He apologized for the distraction the allegation has created for the university and pledged his commitment to fully cooperate with the WAU Board. In response to the information from Ms. Buckingham, the WAU Board did take action, according to a spokesperson at the Columbia Union. The Board Chair was tasked with investigating the matter, and the suggestion was made to seek the counsel of an academic expert on such matters from outside of Adventism. The Board asked that the Chair provide a report to them at its next meeting May 8. So, as the school year comes to a close, the campus awaits a report of what comes next. For the President? For their programs? For Washington Adventist University? A report to the board of trustees is like a business plan, a contract, or some other writing in which originality of thought and expression is not required or expected. These types of non-academic, non-scholarly, and non-journalistic writings do not fall within the ambit of what a prohibition against plagiarism seeks to protect. The allegation that Dr. Spence plagiarized his report to the board of trustees is frivolous. The alleged instances of plagiarism in his doctoral dissertation do not persuade me that he did anything wrong, as he cites his sources. Also, common knowledge is a viable defense to an allegation of plagiarism. One has to give him credit for being well read if not well intended. What does a president have if trust is missing.? How does a doctorate from a Nova compare With Universities such as Harvard, Yale, Chicago, Phil has it right but it is a narrow defense in the minds of a student body who is required the highest standards. What does a president have other than trust and respect.What ever the motive, the presidential status is wounded. The broadcast should have been signed busy body. Then of course he could take a page from Ellen White by writing “I was shown”. it financially solvent, keeping it open and performing what it was organized to do. an aggressive plan to confront those stresses and to promote changes needed. Wow to put that much work into an accusation and not have the courage to use your real name…there is something very wrong with that. Like Satanic accusations as we read in the Bible. oneself – Look what I did!!! IGNORED it. Should not even have made a press notice. Being president is more than writing a paper. Whether or not the document presented to the Board is informal and private, it is intended to sway the directional decisions of a governing board. This was a presidential evaluation. If ever there is a time to be transparent, it is when the highest levels of leadership are being evaluated. It is deeply troubling that Spence apparently would take ownership of vision, leadership models, research, and methods, that are not his own in what appears to be an effort to influence directorial opinion of his professional proficiency and efficacy. Do the yearly bonuses of 40-50% bonuses over his base salary of $105,000 cloud his judgement or compel him to appear more innovative and effective than he really is? The optics here are very poor. That the highest and most visible representative of an educational institution would justify plagiarism in any way is anathema to academia, never mind modeling the “competence and moral leadership” that is central to the WAU’s mission. Spence’s doesn’t deny plagiarism in his dissertation. Instead he relies on the fact that his degree was conferred to him - this is untenable and logically fallacious in the form of petitio principii. That a university confers a degree does not absolve plagiarism if indeed it has taken place. Often degrees are rescinded in such cases where plagiarism is found to have occurred, even if the revelation is well after the fact. In his response to the faculty, why did Spence not address the accusation the author makes that the Board has not given any indication that they would respond to such serious accusations? If indeed an authority “outside Adventism” had initially been engaged to investigate the accusations, would this not be point foundational to the values of transparency, never mind modeling due process? Or, is this WAU reacting to the publicity of these accusations after the fact, and after the Spence addresses the faculty in writing? Since being appointed President (appointed as opposed to the method outlined in WAU’s policy) there have been ongoing and continued rumblings of unethical firing and hiring, punitive action against subordinates who attempt to illuminate areas and issues that lack accountability, an increasingly “voiceless” faculty, calculated and incremental concentration of administrative power, lack of transparency, and instances of outright administrative dishonesty. Eventually, those observing begin wondering if where there is smoke, might there be fire? That the author chooses to remain anonymous (by all reasonable assumption) begs the question WHY? If the author is not connected to the University in any way, it would seem unnecessary to hide one’s identity. But if the author is connected in some way, why would anonymity be necessary in an environment that, for all the words in print, is supposed to be one of collegiality, welcomed accountability, and shared governance? Unless of course those charged with managing the workplace environment do not model these values on the ground. WAU has a optics crisis - of its own making, and seems to fumble the ball at nearly every opportunity to reverse the course of public perceptions. For an institution with such promise and potential it seems to struggle with many of the simplest aspects of business and academia. In any corporate structure where confidence in leadership is in question, when it is clear leadership hasn’t - or otherwise no longer has - the capacity to effectively lead and overcome such obstacles, trust in the institution must be rebuilt. In all cases, the well-being of the institution and it’s stake-holders must take precedence. Will the Board be able to right the ship? Thank you for summing up so clearly the issues that many of us feel are at stake here. The rumblings about plagiarism have continued throughout Spence’s tenure at WAU, beginning with one of the first faculty meetings. The president gave a presentation under his own name that a simple Google search revealed was copied, slide for slide, from another institutional website. If he had only given credit it would have been ethical, albeit mediocre. The fact that he cites sources in his dissertation papers begs the question as to why he would not simply give credit where credit is due, why he would not use quotations mark, and why he would pass off a poorly done paraphrase of someone else’s work as his own. Time and time again, Spence has chosen to given the impression that plagiarized work is his own writing. That the author of these documents has used a pseudonym does not surprise me, especially if that person is a faculty or staff member at WAU. Everyone serves at the President’s pleasure and many have found themselves fired or laid off without cause or explanation. Faculty operate at a distinct disadvantage and in an environment of fear and anxiety over their jobs. The tone was set for relations between the faculty and the president from the first faculty meeting in which he informed them that they were lazy “squatters” and they were “either on the bus or off the bus.” The relationship which, with a bit of tact and humility, could have worked, went off the rails from there. If $105,000 plus bonuses is the sum of the income that the president of a university receives, that university either has a very dedicated president, or the appointee is likely of a low calibre. One gets what they pay for. I would be looking to the governing and owning body to place blame, rather than the president, in this situation. The alleged plagiarism in Spence’s dissertation appears to be in a section in which the literature that precedes and forms the foundation of his original work is reviewed. I notice that several times the complainant admits this. Accordingly, to suggest that Spence is passing off someone else’s work as his own in his review of the literature, obviously written by other people, whom he identifies, is laughable and absurd. It is close to impossible to commit plagiarism in one’s review of the literature. The only way I can think of doing so is to pass off someone else’s review of a specific work or works or the literature as a whole as one’s own. There is no allegation that Spence has done this. That his intended readers are already familiar with the literature and that the literature for them is common knowledge is icing on the cake. The test is not whether the writer has observed various dos and don’ts. I realize that many have this misconception about plagiarism. And I do not deny that there may have been adjudications that rest on this misconception. The test is whether the intended reader can rationally discern or does rationally discern that the writer is trying to claim credit for someone’s else’s work. The alleged plagiarism infractions alleged against Spence with respect to his dissertation do not come within a country mile of meeting this test. Again, Spence’s report to the board of trustees, because of its non-scholarly, non-academic, and non-journalistic nature, does not and can not constitute plagiarism. In such a corporate setting, he is free to copy and paste without attribution as much as he wants. This happens all of the time. “This happens all the time.” - Argumentum ad Antiquitatem. Intellectual theft is not contextual. “The life of the law has not been logic. It has been experience.” Oliver Wendell Holmes, Jr.
feel uncomfortable being employed as teaching staff there. Plagiarism should not cause any animosity in our midst. The Church’s Prophet, whose authority in the Church remains immense around the world, plagiarized a lot. And to date it seems to be just OK’s as not being a problem. And now someone does a literature review and is accused of plagiarism for including parts of the very literature being reviewed? Absurd. This article should not have been published, because it only empowers a story about a person who does not even have the guts to identify him/herself! Shameful. The leader of an institution that teaches careful attribution and aggressively punishes plagiarism in students cannot violate the code himself without penalty. At minimum there is a loss of respect within the academic community; at most is the issue of personal integrity which seems missing in his letter to the faculty. With software that can source almost any published writings, professionals owe it to themselves to be extremely careful. True, the president was not writing for a grade, but he was writing to impress and enhance his reputation. The revelation of extensive borrowing tarnishes the sterling. As others have done, he needs to own up. The Church’s Prophet, whose authority in the Church remains immense around the world, plagiarized a lot. Oh NO!! Not parallel columns!! Where have I seen that before?? Oh right – Donald McAdams. Sigh. Yes, if he’s chasing a bonus it’s no wonder. Why would anyone want the thankless job of having to make the tough decisions to revive an institution on life support on that money. As ghost writer over time for two deans and two presidents. Following their talks several faculty would whisper in my ear great job Tom.